May 12th 2017 - Awareness and Action!! In recognition of May 12th, last week and this week (May 8-19) our Association is participating in a national ME/CFS advocacy effort co-led by Solve ME/CFS Initiative and #MEAction. 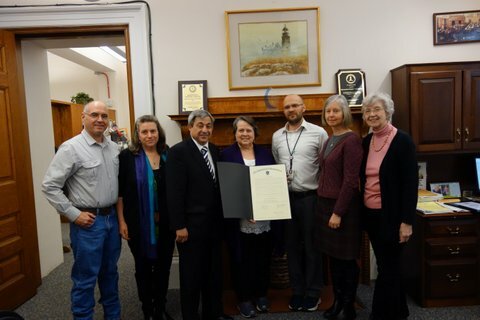 We have completed Week 1, which was “local” week; across the country, ME/CFS advocates visited the local district offices of their U.S. Congressmen/women, and asked for Proclamations from local governments (state, city/town) declaring May 12th ME/CFS Awareness Day. 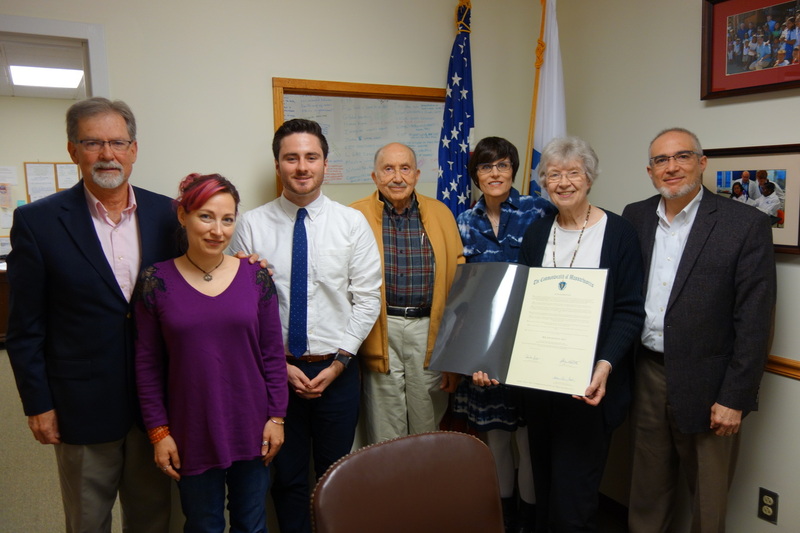 L to R: Rivka Solomon, Rick Glassman (Advocacy Director, Disability Law Center, Boston), Dr. Michael van Elzakker (ME/CFS researcher MGH and Harvard Medical School), Sen. Cynthia Creem, Robert Price, Senate President Stan Rosenberg, Lt. 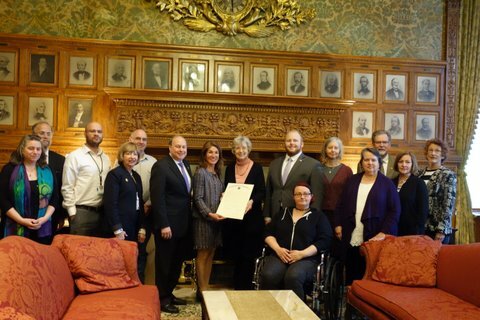 Governor Karyn Polito, Charmian Proskauer (President of Massachusetts CFIDS/ME & FM Association), Dmitri Gridnev (representing Rep. Ruth Balser), Alina Kaminsky, Leah Williams, Elizabeth Potter, Robert Robitaille, Kathy Robitaille, Nancy Smith (those without titles are all members/volunteers representing Massaschusetts CFIDS/ME & FM Association). This week, more than 50 advocates, including Leah Williams from our Association, have descended on Washington, DC, to visit the national offices of Representatives and Senators, share their own ME/CFS stories and invite their elected officials and staffers to a Congressional briefing on ME/CFS, sponsored by our own Massachusetts Senator Ed Markey, tomorrow, Thursday, May 18. Here in Massachusetts, we organized our members and friends across the Commonwealth, and last week they made visits in 7 of our 9 Congressional districts. Thank you all! We also encouraged and supported advocates in six other states who contacted us for information and assistance. 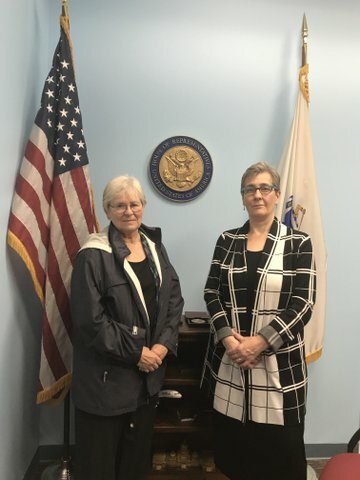 In Congressman Joe Kennedy III's district office. L to R: Bob Robitaille, "Robie" Robitaille, James Cody - District Coordinator for Congressman Kennedy, Dr. Alan Gurwitt, Amy Cuzzupoli, Charmian Proskauer - President of Massachusetts CFIDS/ME & FM Association, Phil Chernin. 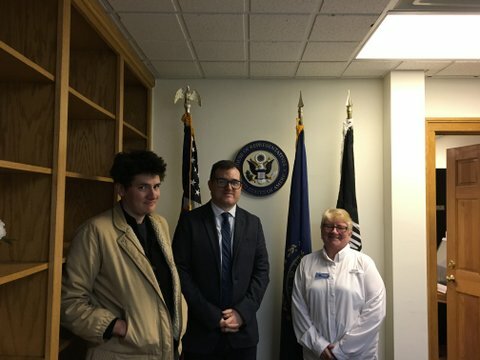 N.H. advocate Grace Woodham with Patrick Carroll and Sharon Nichols at Rep. Carol Shea Porter's office in Dover, N.H.
Our members also got Proclamations for ME/CFS Awareness Day in 4 cities: Northampton, Pittsfield, North Adams and Cambridge, and one from the Commonwealth of Massachusetts. This helps increase awareness in our own cities and towns, especially if accompanied by articles or letters in local papers. Taking one extra step with the Proclamations, by inviting dignitaries for a “photo op” of the presentation, led to a series of very productive discussions with elected officials and supporters at the city and state level. Many thanks to our national advocacy leaders, Emily Taylor from Solve ME/CFS and Gail Cooper from #MEAction! 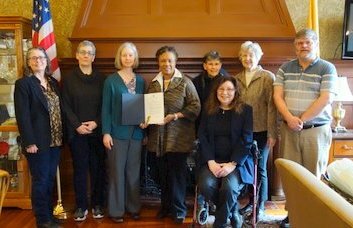 Thanks to Bob and Kathy Robitaille, our Association volunteers who coordinated our state-wide effort, to super advocates Rivka Solomon, Mark Camenzind and Harvey Keith Carden who led the Proclamation project, and to all of you who participated in so many ways! We are Creating Awareness!! And taking Action!! What is your response to the IOM Report? What were your earliest symptoms of ME/CFS?